Home Tactics & Skills Rigging Why Add Side-Imaging Sonar To Your Fishing Kayak? 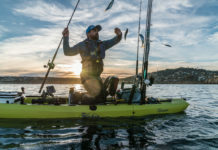 Why Add Side-Imaging Sonar To Your Fishing Kayak? I followed orders and launched a two-ounce bucktail into the cloudy water. As soon as the lure splashed down, my line came tight and I was on with a 40-pound redfish. As the drum dragged me out to sea, I turned to look at Dave. He wasn’t searching the horizon for the next school of fish, he was studying the screen of his side-imaging sonar. 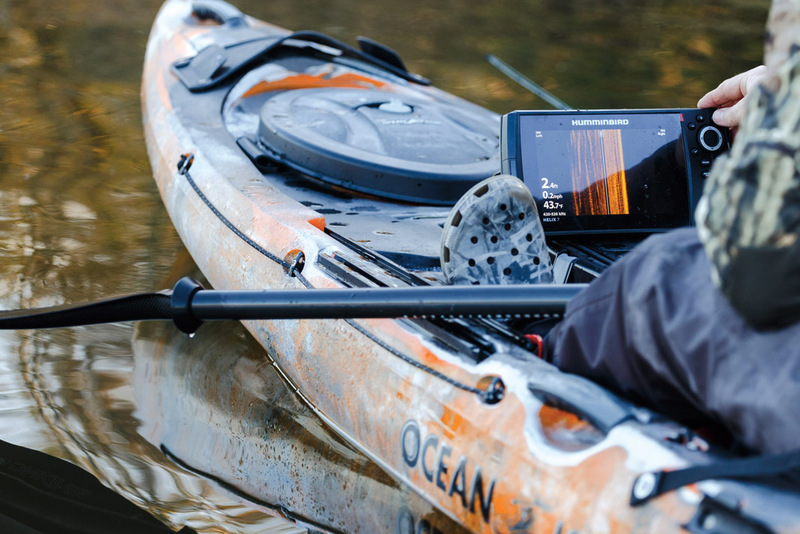 So Why Add Side-Imaging Sonar To Your Fishing Kayak? Side-imaging sonar may sound like something out of 1968 sci-fi adventure 2001: A Space Odyssey, but the most recent advancement in fish-finder technology truly allows anglers to see beneath the water 360 degrees around the boat. Since the first side-scan sonar hit the markets in 2000, the images and overall performance have improved. “The biggest advancement was going from an analog to a digital signal, allowing us to use CHIRP sonar,” Freeman says. CHIRP sonar sends two signals at different frequencies then analyzes the return for a monochrome photo-like image of the bottom. Side-imaging sonar can produce an image of the bottom up to 80 feet on either side of the boat. Freeman suggests installing the sonar where it can get a clear view of the bottom from side to side. 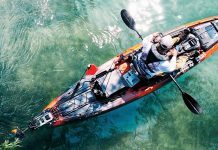 Turbulence under the kayak can affect the image, so he recommends installing the transducer in a location far from pedals, propellers and paddles. For further instructions on installing side-imaging sonars in kayaks, I hit up Johnson Outdoors pro, Rob Choi. Not only does he paddle the same boat I use, but he’s figured out a quick way to install and remove the transducer. Many kayaks come with a large scupper to accommodate a transducer. A side-imaging transducer needs a clear image of the water to either side of the kayak, requiring it to hang below the kayak hull. Choi uses the moldable plastic to create a support for the transducer. Once I had my plastic support molded, I installed the transducer and used zip ties and a short piece of one-inch PVC to hold the transducer puck in the scupper. I ran the power cables to a rechargeable closed-cell, 12 V, 10 A battery powering the unit all day. The battery cable passes out of a front hatch to the display unit so I didn’t have to drill any holes. I can remove the whole system in minutes. Side-imaging works best when the kayak is moving. Once I found structure or a fish mark, I could switch to down-imaging to investigate. Freeman suggested I adjust the filters on the signal. “Low noise will show less detail but also less interference,” he explains. Higher noise will mark smaller baitfish but also display more clutter. Freeman warned me against reducing the surface noise, “A kayak is going to roll around and produce turbulence. Reducing the surface noise could affect shallow-water performance.” Once the side imaging sonar is dialed in, the fish can’t hide. 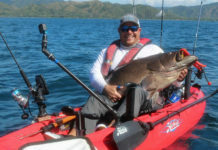 Follow us @kayakanglermag to stay up to date on the latest gear and don’t forget to check out our buyers guide.